Barca moved ten points clear at the top of La Liga thanks to a 4-1 victory at Real Betis on Sunday, while they are also through to the final of the Copa del Rey, where they will face Valencia. We have to take things one match a time and not get carried away. And the Catalan giants are still very much involved in the Champions League, have progressed to the quarter-finals, where they have been drawn to face Manchester United. 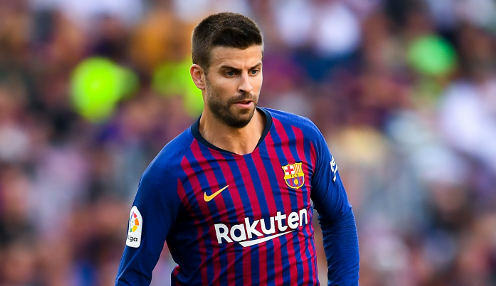 However, Pique is adamant that complacency will not be allowed to creep in during the final couple of months of what could turn out to be a famous campaign. He told Marca: "We know there is a still a long way to go in every competition. We have to take things one match a time and not get carried away, despite a lot of people now becoming very excited. "We are in a very strong position in La Liga and we are through to the Copa del Rey final, while we know how difficult the Champions League is at the quarter-final stage." Barcelona are currently priced at 6/4 to win the Champions League this season, while they are 8/13 to reach the final, which will be played in the Metropolitano in Madrid. Meanwhile, the Blaugrana are waiting to discover the extent of the ankle injury sustained by the in-form striker Luis Suarez during the closing stages of the win over Betis. The 32-year-old Uruguay international had to be replaced by Philippe Coutinho in the final minute of normal time, with Suarez having scored five goals in his last six games in all competitions.